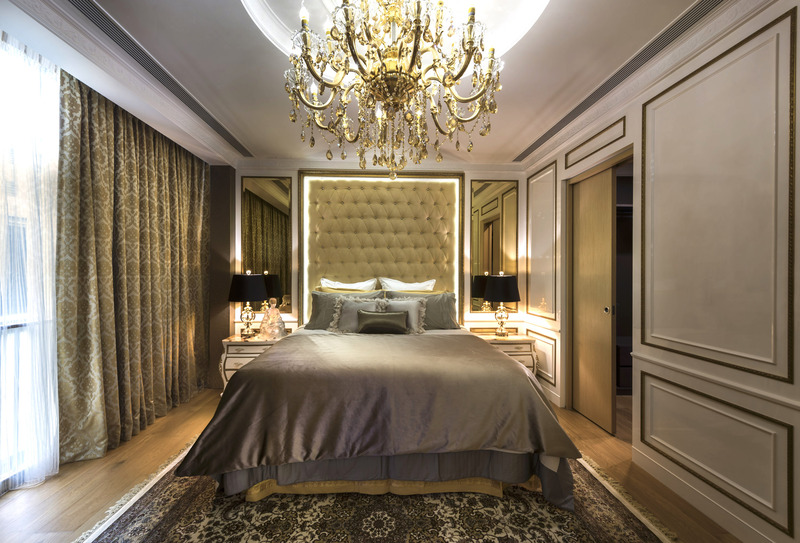 Unmistakeably regal and unabashedly sumptuous, the carefully orchestrated opulence of the Victorian and oriental elements that weave into the elegance of a project in the Palms @ Sixth Avenue are made for modern day royalty. Dripping in gold, with rich shades of brown and red throughout, drama takes claim at every turn of the palatial residential domain. Attention to details is not spared anywhere as East meets West in complementary and surprising ways, through elaborate details within intricate cornices, custom-made furniture pieces and grandiose wall and ceiling features. 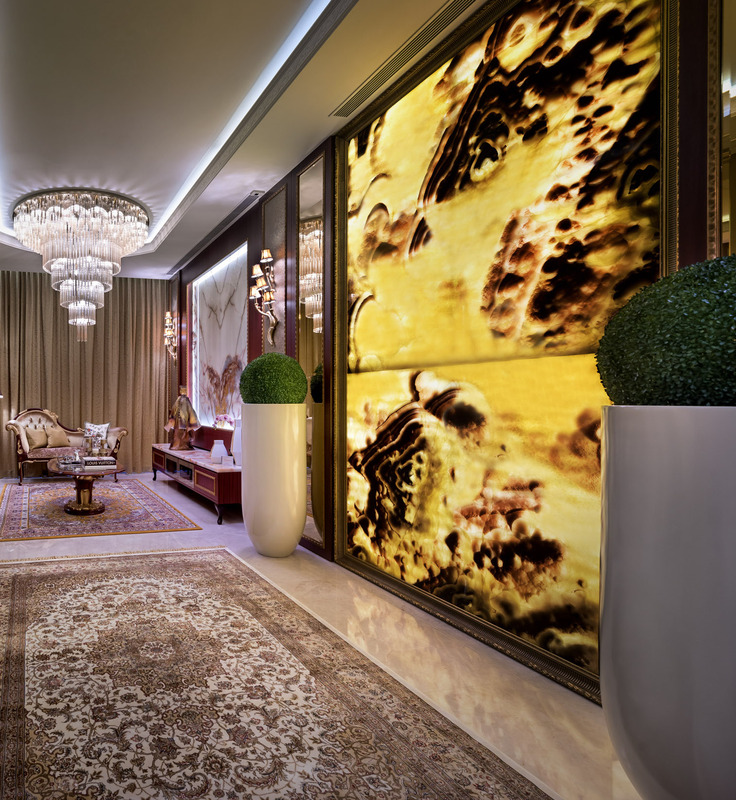 A reflection of an owner with a penchant for European designs but with core beliefs anchored in Eastern traditions, the unit fuses the diverse influences into an auspicious-looking interior that is traditional, yet worldly. 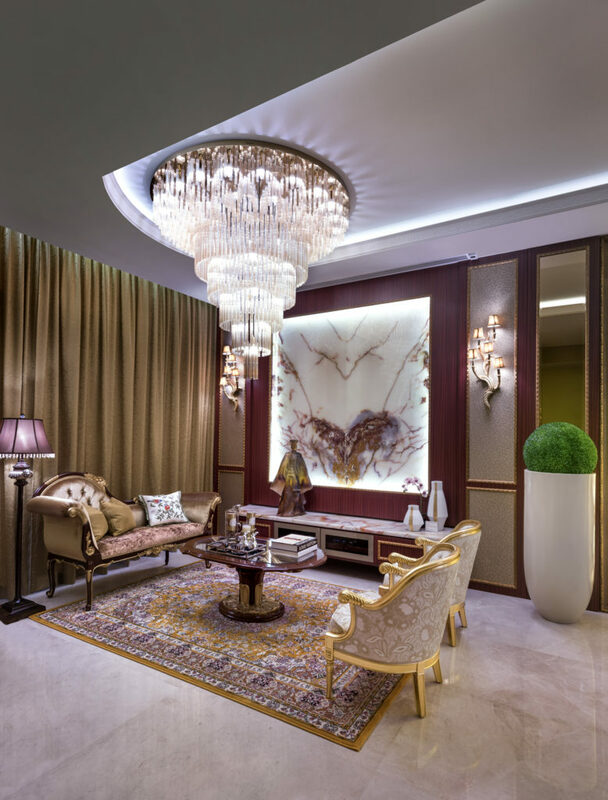 With rich hues of red and gold bringing well-ordered harmony and balance to the stately interiors, lush natural materials, like the noble Honey Onyx, and features, like the custom six-tiered living room chandelier, command the space and inspire awe with their presence. Grand in scale and approach to luxury, attention to detail pulls the visually arresting spaces together with an air of effortlessness. With a distinctly Victorian panache, dramatic wall panels in living and master bedroom areas beacon with poised symmetry, while the intricately hand carved chaise lounge and coffee table draw attention to the craftsmanship of their ornate details. Throughout, delicate leaf and floral patterns found in soft furnishings, drapery and rugs delight with their elaborate detailing, while bringing reprieve to the dramatic flair of the residence and letting the comfort of a home set in.